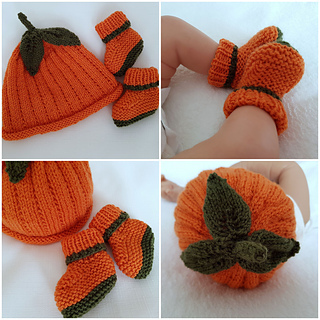 Such a cute knit for babies in the Autumn season. 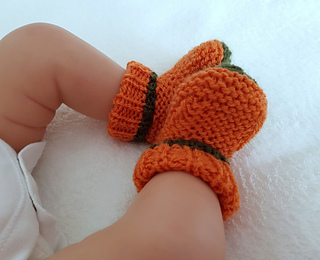 This adorable hat and booties set would be the perfect accessory to a halloween party costume or as a welcome home gift for a baby born in the fall. The pattern is worked flat on two needles and is a quick knit. 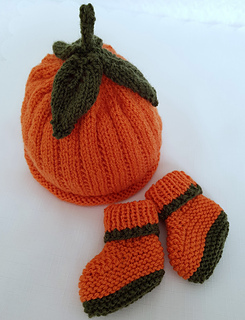 Instructions are given to knit the hat & booties in sizes 0-6 and 6-12 Months and each set requires under 100g of yarn to complete. 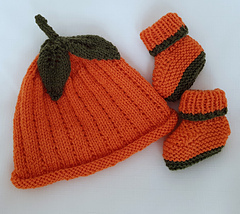 Set shown is knitted in Paintbox Yarns Simply DK but any standard DK (light worsted) weight yarn knitting to the correct tension could be used as a substitute. The pattern is suitable for an advanced beginner and would be great for charity knitters.